In 1999 I was seven years old and leaving the fad of Hot Wheel car collecting to the fad of Video Gaming specifically on the N64. There were many N64 games I was thoroughly addicted to as a child, one of them was easily this mixed-reviewed vide game Hot Wheels Turbo Racing. But that’s what was so cool about this video game, it wasn’t just about the racing. 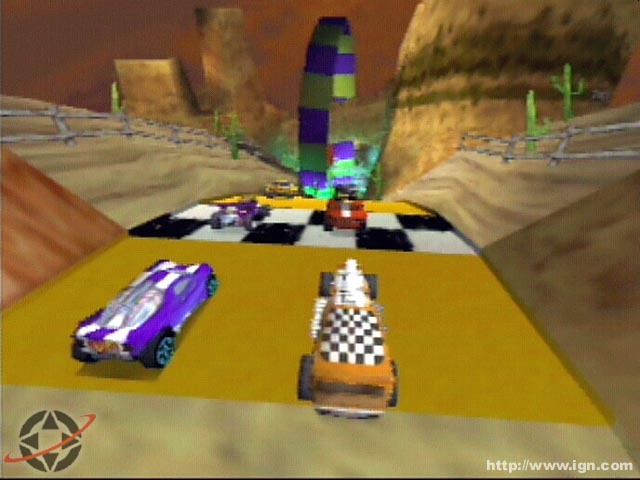 Each track gave you specific goals to move forward levels, one of them was being able to collect all the mystery cars in secret locations. I know that many racing games today have done this, but Hot Wheels Turbo Racing was one of the first racing games to hold the shove that broke that ground. As a young Hot Wheels car fanatic it was also pleasing to race using cars that we owned or had collected such as the orange car above. Hot Wheels Turbo Racing has been relatively forgotten with time, like a lot of spectacular video games out there. It’s most critical hit was on its basic graphics which pretty much only show us primary colors. For its time this was good on the eyes though, especially as a seven year old. With addicting goals and relatable substance, Hot Wheels Turbo Racing holds a special place in my memory. It is possible that my nostalgia insists that the game is better than it actually is. Regardless, I loved it and it was one of the greatest N64 games I ever played.